Is it possible that the woman in the background is also a fakery victim? The halter top seems to be imprinted on her short-sleeve top. Either that or her top is so very sheer you can see her bra underneath. Perhaps the lady in the background is wishing she got the appliqued pockets instead of the appliqued bra! I’m intrigued by the packet description: “Pockets are make believe”. Surely that depends on the perception of the viewer, not the intention of the sham-pocket creator? OK, semantic hair-splitting, but interesting choice of words. 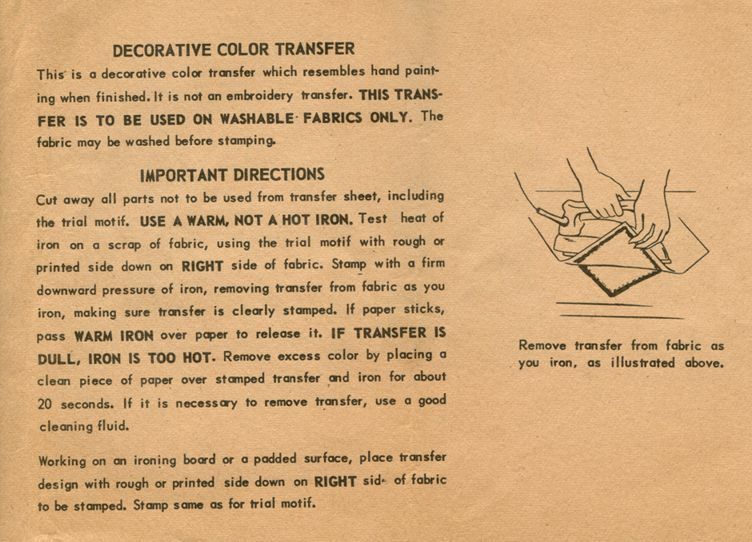 The “handpainted effect” – is that achieved via the transfer? Does this make them DOUBLE sham pockets? Oh, the shame of it! I’ll just take a moment to make believe that I’ve made this skirt with sham pockets (I’m thinking bottle green to set off those gold tassels)and move swiftly on – possibly to a “real pockets/sham skirt” project (in an attempt to redress the balance). I am also annoyed by the blouse on the lady in front. It looks very lovely and simple, but you could not construct a collar like that without more seams. I know this is a skirt pattern and that the fake collar was probably invented by the illustrator, but I feel a little cheated anyway. anonymous – I would use one of the wonderful pattern links on the side and look for Wiggle dresses – very Bettie Page. FAKE POCKETS! What a travesty! Pockets should never, ever be make-believe. All fauxpockets are bad; and all slacks and jackets should have real pockets. Recently the fashion columnist for the Wall Street Journal said that she cuts the pockets out of her jeans and sews them shut so it doesn’t “ruin the line”. A good way to ruin a good pair of jeans.I have been reading this site for months and love it and the comments. Finally decided to put in my 2 cents worth. Gail– I have noticed a trend toward truncated pockets in women’s pants and jeans. The pocketing opening is there, and real, but it opens into a little half-inch faux pocket, or in the case of front pockets it will end just below the hip crease– just enough room to put something in and be guaranteed it will fall out.This. Annoys. The. Crap. Out. Of. Me. If anything, I would also make real pockets and possibly use the transfer as a guide for trim. I might omit the tassels, or else use real ones. Fake pockets are bad; fake “handpainted” is worse; but fake tassels? That’s the worst for me.I thought that the illustrators made the tops look realistic for skirt patterns. 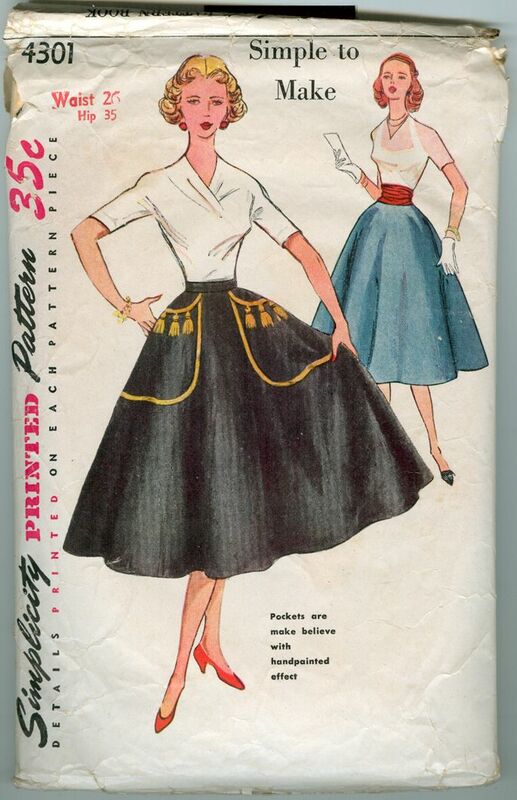 Perhaps this illustrator was so disgusted by the fake pockets that s/he had to draw unrealistic tops to go with them.Sandra/anonymous, have you watched The Notorious Bettie Page? That movie should give you a good idea of the styles that she wore, which did include pencil skirts and wiggle dresses. Bravo to all the above! Yep, I’m with everyone that said to just make the pockets and use the fake ones as a pattern! Such simpletons thinking that they could get away with out putting pockets on! Makes you wonder how many people bought the pattern thinking that it actually had pockets! I’m thinking that a lot of people were pretty ticked off w/Simplicity! And they didn’t have the internet to sound off at them! They had to snail mail their gripes!Oh well… hopefully they learned their lesson. Instead of the gold and the tassels, this poor lady needs “Harold and the Purple Crayon” pockets. Just draw them on as the pattern says, make-believe, and they instantly BECOME REAL POCKETS! Perhaps this is a 1950’s “Designed BY Women, FOR Women” thing, where more experienced wives groom teens to be appealingly helpless and dependent upon men? This way, he’ll not only have to unlock the door for you when he drops you off, he’ll have to carry the key! The housewives group also discourages the carrying of a purse, so the date will always have to pick up the tab. Stocking tops are outfitted with a special elastic band to hold a lipstick and a dime for emergency phone calls (to the group.) Interestingly, the daughters of two women from this movement went on to write The Rules. Oh no. Those pockets are Make Believe according to the packet. Not fake. That’s an entirely different category. You can put Make Believe stuff into Make Believe pockets. Fake stuff will not fit in Fake pockets. ooohh…there’s probably a special Sisterly Ceremony where the Make Believe wedding ring carried throughout courtship in the Make Believe pocket is exchanged for the REAL ring! LMAO Anonymous! The only problem is remembering to take your make believe lipstick out of your make believe pockets, otherwise you get make believe stains all over your skirt! Imagine the horror! The model looks REALLY dismayed to be trapped in that skirt! I think it was a photo taken at her initiation ceremony into the [Future] Dependents of America group. The lady in the background is one of the group leaders, reading off its mission statement, secret oath, rules, regulations and strategy. Cookie – Are you kidding me!? Stocking with lipstick and dime holders? I am intrigued. PS I am so glad you have stuck with your real photo cookie. THANKS! Strangely…I do seem to remember someone designing a stocking or garter that had a little pocket for essentials. Maybe in the 1920’s? Can we bring back the chatelaine, maybe? In addition to full, real pockets, of course. And as class toady, can I offer a shiny red happy birthday apple to Miss Erin? Have a lovely, pocket-filled day! I burst out laughing when I saw this — it’s FABULOUS!I think I’d make the skirt with side seam pockets but also use the transfer pattern to add Make Believe Pockets. It would be the most confusing skirt ever. Real pockets or fake pockets, either way, make one’s hips ‘Hippo-size.’Bulge on bulk is never slimming. A cupboard in my kitchen that is under my stovetop has a handle on it – but it doesn’t open. It’s a fake drawer. I hate that. Plus, my kids keep trying to open it, and someday that handle is going to get ripped off.My husband hates fake things so much that he wouldn’t buy a dresser that had four drawers but was made to look like it had five. LOL, they were very lazy sewers back in the day, though it dose look like it could be a nice skirt! Yes! Fake drawers are SO annoying! I’m intrigued and repelled also by fake windows – here in the UK you often see odd gaps where windows should be, sometimes painted black with white cross-frames. This curious practice dates back to a hefty window tax introduced under the wonderfully named Act of Making Good the Deficiency of the Clipped Money, 1696 – according to Wikipedia – which served to incentivise this peculiar fenestral fakery. It was also alleged to be the origin of the phrase “daylight robbery”, but Erin could probably put us straight on that one.This was in lieu of income tax, by the way, which was way too controversial and unpopular to introduce at the time. But you can see how it would tend to tax the wealthy.So, which of the presidential hopefuls over there would have the gall to suggest a real-pocket tax, I wonder? – on the grounds that those with lots to put in their big pockets can afford to loose a little. My, how we’d all suffer here on DaD! Here is a prime example of a fakery we live with every day, in all communities: SHUTTERS BOLTED TO BUILDINGS THAT WOULDN’T EVEN COVER THE WINDOWS IF CLOSED! This started to drive me crazy once I noticed it. You’ll see a long picture window on a Colonial Revival house, flanked by one slender shutter at each end, perhaps even sporting cunning cutouts. You’re fooled into thinking, “How quaint…how pretty. What lovely contrasting shutters in Williamsburg Blue.” Then the shock sets in, for one does not have to be an MIT graduate to grasp that those dinky little shutters would NEVER span the window’s length. You trespass and grasp at the shutters, vainly trying to prove your theory by closing them…but the nightmare continues as you realize they’re fixed in place, and what you have in your trembling and soon-to-be handcuffed hands are shutters that will never actually SHUT! How can we expect our nations children to grow up honest when THIS is what we give them?? Cookie, this is my second reply on fake shutters (the other is in tomorrow’s post, time travel being one of my many wonderful qualities I’ve attained since passing 40) and I realised I was so wrong to state that Britain has no shutters. It does. But they tend to be of a certain age and internal, located in shutter boxes to the sides of sash windows. The house I live in has them in every room (how embarrassing of me to overlook that!) BUT, alas, most of our shutter boxes are empty, the folded shutters that should hang inside having been dismantled by a previous occupier, possibly as firewood some extended cold winter long ago, I imagine. It’s a real pity because they work beautifully to keep the warmth in during the winter as well as the heat/glare out in the summer. So, this isn’t precisely fake shutter territory, but maybe we could file it under “shutter disappointment”.Looks like I need a holiday (preferably in a Tuscan farmhouse with adequate shutterage). I know the type you mean! We have them in some finer Victorian homes over here…and yes, sometimes the shutter boxes are empty. BUT sometimes they have been painted or paneled over and ignored for decades, and a lucky dweller suddenly discovers they have hidden shutters throughout their whole house! Our exterior shutters I think were originally there not so much for privacy or warmth, but to protect windows from being lashed by heavy east coast winds, which in some locations can actually tear shingles off houses! It is THOSE exterior shutters, which once did such an upstanding job, that have been reduced to a mere mockery of their former selves. Thanks for your post!